9. After the first draft of the Science Standards, what are the next steps? 8. Standards Review Progress: What is Happening with the Science Standards Review? 7. How can I use my summer to get ready for upcoming science standards? 6. How can I influence the next science standards? 5. What new ideas about science assessment might support our next science standards? 4. What new ideas about science instruction might guide our next science standards? 3. What new ideas about science learning might guide our next science standards? 1. When will we get new science standards? Will we adopt national standards? The second draft of the 2019 Minnesota Science Standards was published February 14th. There were about 470 responses on the feedback survey (1/4th of them from groups) and about 50 emailed comments. There was a wide range of ideas that participants presented with the largest issues of concern being the sequence of benchmarks in middle and high school, inclusion of contributions of American Indian communities, and the wording of benchmarks and examples. Thank you to all the persons who took time to complete the survey and elaborate on their ideas. Committee meetings are scheduled in April and May with smaller writing and editing groups working between meetings. In particular they will be editing and rearranging benchmarks based on suggestions from the feedback with a concern for achieving greater consistency. The final draft should be available in late May, which people can start using for planning. The Minnesota Department of Education (MDE) will begin conversations with the Board for Professional Educator Standards and Licensing (PELSB) concerning adaptations in licenses and standards to support the final standards. MDE plans to develop resources for instruction, professional development, and district implementation. The standards become law through the state’s rulemaking process. During that process, the date is set for the full implementation of the standards and the new version of the MCA exam. This time period is likely to be in the range of four or five years. Hence there could be time for one or two years of planning and professional development before schools might start phasing-in changes of instruction to reflect the new standards. We plan to develop resources for instruction, professional development, and district implementation. The second draft of the science standards and information about the standards revision process is at the MDE Science webpage. A series of articles on the science standards development is at the Minnesota Science Teachers Association standards page. After the first draft of the Science Standards, what are the next steps? A big step has been completed on the way to new science standards. The first draft of the 2019 Academic Standards in Science was published November 9th and was open for feedback by online and in-person meetings. There were 231 responses to the survey, 73 attendees at the Minn. Dept. of Education Open Houses and 156 participants at MnSTA meetings or sessions at the fall conference. Thank you to everyone who reviewed the draft and put energy into providing thoughtful feedback. This is an important component of the standards development process. The Standards Review Committee at their December meeting read all the comments and analyzed the patterns in the responses. As expected, there was a wide range of responses. The majority of the responses favored the major organization of having standards based on Science and Engineering Practices and having Benchmarks as three dimensional statements that combine Practices, Core Ideas and Crosscutting Concepts. The committee affirmed this direction, but wants to make some adjustments for the second draft. Format of the standards and benchmarks that makes the progression of core ideas (content concepts) easier to track. Assignment of core ideas in elementary grades to provide continuity to current topics whenever possible and yet preserve learning progressions. Addition of chemistry and physics standards to support the graduation requirements. The second draft will be published February 14th and available for feedback until February 28th. Watch for announcements of feedback meetings and the online survey at http://bit.ly/MNSciStds . The final draft will be available in May and there will likely be a three or four year period to phase-in the standards and benchmarks. Standards Review Progress: What is happening with the science standards review? The science standards review is off and running. The review committee of 36 representing various stakeholders started with a three-day retreat in early August. They shared their vision for science learning, delved into research about science education, compared our current standards to other states, and determined desired attributes for the next standards. In September they looked at data on our current standards and their implementation using information from an online feedback survey in August. They will started to organize to write the first draft by early November. During October the determined the starting point and organization of the first draft and smaller writing teams started to write standards and benchmarks. The first draft will be published Nov. 8 in time for the MnSTA conference and will be posted on the MDE Science page. The draft will have major changes from the current standards. Several ideas will intentionally be tried out to get reactions from teachers and other stakeholder. Feedback for the first draft will be collected through sessions at the MnSTA conference, at town hall meetings across the state, regional meetings hosted by MnSTA regional directors, and an online survey. Those dates are later in this newsletter. There will be a second draft in February and the final draft in May. I hope that you will add your ideas for making the standards effective for student learning during the ten year span of the next standards. Go to the MDE Science page for more information about the committee membership, process, timeline and especially the Assumptions that are guiding the standards review and revision. How can I use my summer to get ready for upcoming science standards? Summer is a great time to think beyond the daily preparation of lessons and gain some perspective on the longer term future. With new science standards coming next spring, the vacation period is a good opportunity to reflect on the changes in science instruction that are likely occur. The committee will begin their work August 1 with a three day workshop and then meet monthly through the year. Writing teams of content areas and grade levels will work between meetings to draft standards language. The standards will be informed by A Framework for K-12 Science Education and include the dimensions of the scientific and engineering practices, crosscutting concepts, and disciplinary core ideas. This document from the National Research Council was the research base for the Next Generation Science Standards (NGSS). However several Minnesota Statutes make it impossible for us to adopt NGSS as written, including the requirement for standards and benchmarks. The whole list of assumptions are at the MDE Science page. It would be good to use the summer months to become familiar with the Framework. It explains the dimensions that are described in the Assumptions. You can get a free download of A Framework for K-12 Science Education at www.nap.edu. A good overview of the Framework is in the articles I wrote earlier about the standards process at the MnSTA Standards site. This would be a good year for a membership in NSTA, which provides access to the many great resources, and the nation convention in St. Louis next spring. How can I influence the next science standards? The beginning stages of the review and possible revision of the Minnesota science standards are starting now and the process will continue through the next school year. With the importance of these standards for the future of science teaching and learning, you maybe be wondering how you may be able to influence the standards. An overview of the standards development process was outlined in an article in the MnSTA newsletter in December 2016. That article is archived at the MnSTA Science Standards page along with articles about ideas that will likely be included in potential standards. Here are some specific ways you can be involved. Who will be on the Standards Review Committee and what is the time commitment? The tentative plans call for the committee to have monthly full-day meetings in Roseville from August until April. There will likely be a three day initial meeting in August. Depending on funding, there will be coverage for substitute and travel/lodging expenses for those outside the metropolitan area. Committee members must commit to participation in all committee meetings. There will be additional online meetings of technical writing teams between meetings. So you should expect to have a commitment of 12 days of whole committee meetings plus additional reading, writing and online discussions. The committee will be guided by a set of assumptions that define the format, requirements and foundational documents that will guide the committee work and the standards document. These assumptions and the timeline will be posted with the application documents. How can I contribute my ideas if I am not on the committee? Feedback on the implementation of current standards: During the 2016-17 school year science staff from MDE visited regional gatherings of MnSTA member to discuss the standards development and gather input. The participants completed an online survey on how well the current standard are being implemented in schools. If you did not get a chance to participate, please complete this survey. Online feedback about the current standards: This spring you will be invited to comment on general aspects of the standards and specific standards and benchmarks. Feedback on the first draft: This draft is likely to be available in early November in time for the MnSTA conference. In addition to an online survey, there will be town hall meetings in regional locations across the state. These input opportunities will have a significant impact on the direction of the standards. Feedback on the second draft: The second draft will be sent to a couple national science education leaders for expert review. In addition there will be will be online feedback and focus group meetings concerning specific aspect of the standards, such as equity, environmental education, and career focus. The final draft should be published by May so that schools can start using them for planning and curriculum work. Full implementation along with the revisions of the MCA should be scheduled for three or four years later. If you have questions about any aspects of the standards review process, contact John Olson, (john.c.olson@state.mn.us) Science Content Specialist. What new ideas about science assessment might support our next science standards? In previous articles I have described how research on science learning collected in A Framework for K-12 Science Education (Framework) might influence our next Minnesota science standards. Many of its ideas for instruction are great supports for our current Minnesota standards and the assessments that support instruction and learning. So it is wise for teachers to start studying the assessment practices that have been developed by various organizations, which are based on the Framework ideas. First, a quick aside: You may have expected that this article might focus on changes to the MCA (Minnesota Comprehensive Assessment), so let me comment on that briefly. When the next Minnesota science standards are published in their final draft form in spring 2019, the Mn Department of Education (MDE) assessment division will start the process of preparing the MCA IV to assess the new standards. This assessment will likely begin in the spring of 2022. Most states that have recently adopted new standards are based on the Science and Engineering Practices, Crosscutting Concepts, and Core Ideas from the Framework. If those “dimensions” are the basis of the next Minnesota Standards, the MCA will likely contain items that reflect the integration of these dimensions. On a larger scale, Achieve, Inc. had teachers write Classroom Sample Tasks for middle and high school blend content, practices and concepts from science, math and English/Language Arts. For example, a middle school assessment task on antibiotic resistance assesses content related to genetics, natural selection, probability, graphing, constructing arguments and literary research. These tasks have extensive documentation. They are posted at https://nextgenscience.org/classroom-sample-assessment-tasks. MDE science staff are working with our colleagues from several other states to develop professional development resources related to three-dimensional science formative assessment that we will start to share with district leaders and at conferences. What new ideas about science instruction might guide our next science standards? How might “argumentation, model development, phenomena and computational thinking” enter our teaching strategies? This is the fourth in a series of articles providing background for the review of Minnesota’s science standards in 2018-19. The previous articles are archived at the Minn. Dept. of Education page on the MnSTA Website. When the Minnesota Science Standards Review Committee meets in 2018-19, they will first look at feedback about our current 2009 standards and then look at current research on science education. Research over the past dozen years has provide several new ideas about science instruction that are summarized in a document that was written to lay the foundation for science standards. A Framework for K-12 Science Education (2012) was prepared by the National Research Council using leaders in science content, learning sciences and science instruction. This document provided the foundation for the Next Generation Science Standards (NGSS) and all the state standards that have been adopted within the last three years. The Framework is a free download at the link above. Here are some major ideas about instruction in the Framework. The Framework describes a limited number of elements that should be developed across grades K-12. They are organized into three dimensions 1) scientific and engineering practices, 2) crosscutting concepts, and 3) disciplinary core ideas. In our current Minnesota science standards, many of the ideas in dimensions 1 and 2 are in the Nature of Science and Engineering strand and the ideas in dimension 3 are similar to our content strands. However the emphasis of the Framework is that the three dimensions should be woven together in all science instruction. We find that much of the science instruction in Minnesota schools is weak in integrating these ideas throughout science instruction. Let’s dive deeper into the three dimensions. The practices in blue are well-represented in our current Minnesota science standards and are generally part of our use of “inquiry” and “engineering design.” The items in red have some overlap with the Literacy Standards in Science that are in the Minnesota English/Language Arts standards, although the Framework has some additional concepts. The items in green have somewhat different approaches that we have traditionally used in our science instruction. A good description of how several of these practices can play out in the classroom is the short, free, teacher-friendly book Ready, Set, Science! This link Has a video that demonstrates a couple of the practices in action. These concepts cut across all areas of science and engineering and help students develop a coherent scientific view of the world. These concepts should be reinforced by repeated use in instruction across the disciplines. These are the major concepts that we in Minnesota often call content standards. They are organized into familiar groupings: 1) Physical Sciences, 2) Life Sciences, 3) Earth and Space Sciences, and 4) Engineering, Technology and the Applications of Science. The Framework selected core ideas that are key organizing concepts in a discipline, have broad importance across disciplines and relate to interests and life experiences of students. Hence many ideas in Minnesota standards are not in the Framework and the Framework core ideas are often assigned to earlier grades than in Minnesota. The Framework provides learning progressions for each of the ideas in the three dimensions. For example, for the practice of argumentation (7) in early grades student learn to link claims with evidence, in middle grades they focus on the reasoning to support or refute explanations, and in upper grades they construct counter-arguments using data analysis. Many instructional models can be used in helping students learn in a three-dimensional style. One model gaining interest is to plan a series of phenomena that students explore and then develop explanations. As they move from one phenomena to the next their mental models of what is occurring in nature gains in sophistication. A good resource for examining many facets of instruction are the STEM Teaching Tools Practice Briefs. The Next Generation Science Standards has prepared a model of standards (called performance expectations) that bring together the three dimensions. While the format does not meet the Minnesota statutes that require standards and benchmarks, the ideas and structure from the NGSS will be examined by the Science Standards Review Committee. Look for sessions on the standards revision process and teaching practices at the MnSTA Conference on Science Education in St. Cloud Nov. 10. For questions, contact john.c.olson@state.mn.us. What new ideas about science learning might guide our next science standards? This is the third in a series of articles providing background for the review of Minnesota’s science standards in 2018-19. The previous articles are archived at the Minn. Dept. of Education page on the MnSTA Website. When the Minnesota Science Standards Review Committee meets in 2018-19, they will first look at feedback about our current 2009 standards and then look at current research on science learning and science standards before starting on any revisions. Research over the past dozen years has provide several new ideas about science learning that were summarized in a document that was written to lay the foundation for national science standards. A Framework for K-12 Science Education (2012) was prepared by the National Research Council using leaders in science content, learning sciences and science instruction. This document provided the foundation for nearly all the states that have adopted new standards the last three years and the Next Generation Science Standards. Here are some of it’s major findings about student learning. Children starting school are surprisingly competent. They already have substantial knowledge of the world. They are not concrete and simplistic thinkers and can use a wide range of reasoning processes that form scientific thinking. It is important to build on and refine prior concepts to develop increasingly more sophisticated explanations of natural phenomena. There should be a focus on a limited set of core ideas and an avoidance of a coverage of multiple disconnected topics. The core ideas provide structure for adding new understandings over time. Learning difficult ideas takes time and often comes together as students work on a sequence of tasks that encourage them to synthesize ideas. We should focus on important core ideas and develop learning sequences (called learning progressions) that build the learning from simple ideas to more broad explanations over several years. Science is both a body of knowledge about the world and the set of practices that develop that knowledge. Scientists and engineers use a variety of methods and sequences in their work. Our students should develop practices that include investigating, designing solutions, analyzing evidence and constructing arguments. A rich science education captures the students’ curiosity about the world and their interest in learning science. Instruction should be relevant to their daily lives and also prepare them for later education and careers. Students must have equitable access to quality instruction, materials, time for learning and teachers. Instruction should recognize the diverse customs and orientations of different cultural communities as an asset for science learning and should value multiple modes of expression. I recommend studying the Framework and starting to use its ideas as supports for improving instruction for our current Minnesota science standards and as a preparation for possible changes in the standards in 2019. The Framework and several reports on which it was based are available as free downloads at www.nap.edu. I also recommend How Students Learn Science in the Classroom (2005) and Taking Science to School (2007) from the same site for a deeper look at ideas about science learning. With this edition of the MnSTA newsletter, we are following-up the winter edition and developing a series of articles about preparations for the next Minnesota science standards. My colleagues at MDE and I plan to share ideas about science learning and teaching that have come from research and teaching experience, which might influence the writing and implementation of our next science standards. What new ideas about science assessment might guide our next science standards? What are science teachers saying about our current science standards? During the 2015-16 school year, MnSTA held regional meetings where teachers came together to give feedback about the current (2009) Minnesota science standards. Minn. Dept. of Education science staff (John Olson, Doug Paulson, Jim Wood and Dawn Cameron) facilitated at least 10 sessions. The 525 participants completed an online survey in which they gave their impressions of how the current science standards are being implemented. If did not attend one of the meetings, we invite you to complete the survey. Now would be a good time to take 10 minutes to complete the survey at this link before reading the rest of the article. 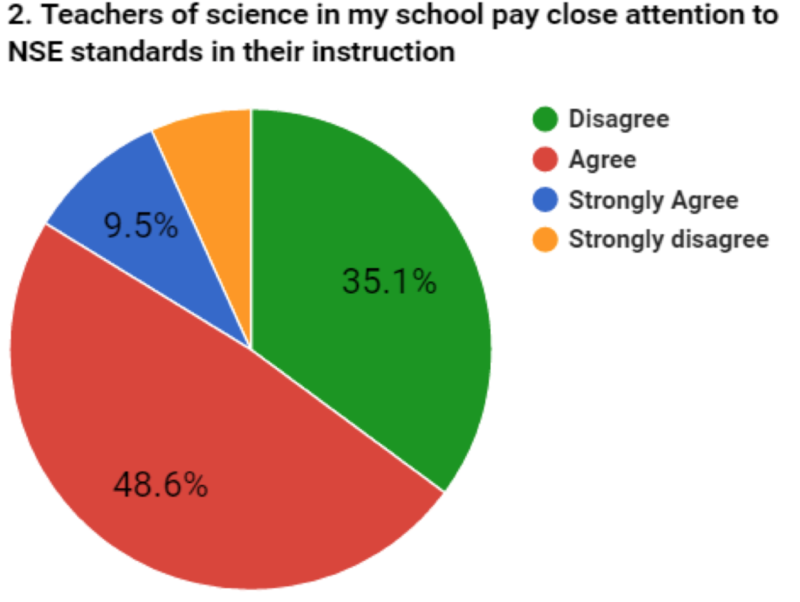 As we look at the data from the survey we must realize that the responses are from teachers that chose to come to a regional meeting of science teachers. They are probably not representative of the whole science teaching population, but they are valuable for comparison purposes. A section of the survey asks the participants to state the degree to which they agreed or disagreed with a statement. Notice that the participants are giving their perception of what other teachers are doing. 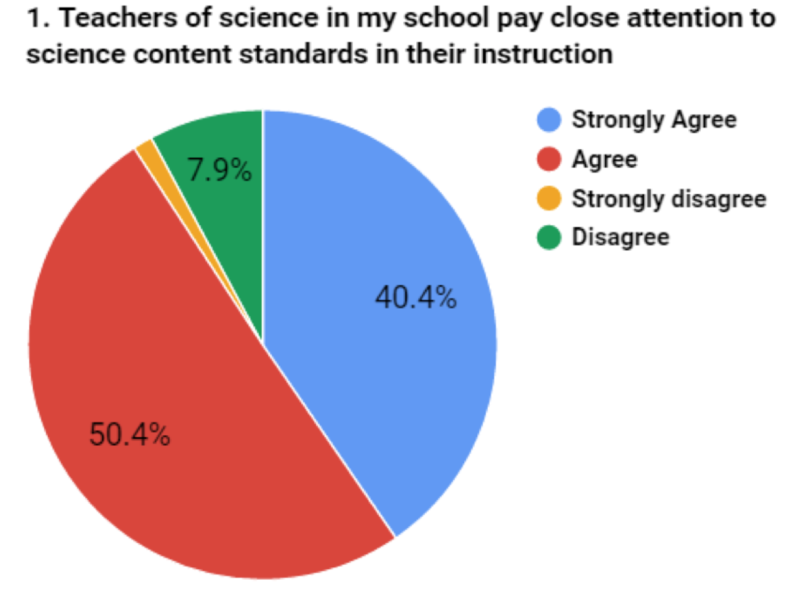 It is encouraging to see that the participants perceive that possibly 90% of teachers are paying close attention to content standards (physical science, life science and earth/space science). However only about 60% pay close attention to the Nature of Science and Engineering standards (NSE). The writers of the 2009 science standards intended that the NSE strand should be of equal importance to the content strands. In the discussions among teachers about factors that influence that practice, they mention that textbooks often emphasize the content concepts and knowledge. NSE concepts are often difficult to assess, especially in written tests, and hence are not as prominent on the MCA. The standards writers also intended that the Nature of Science and Engineering standards should be integrated with instruction in the content areas. The survey indicates that possibly less than half of teachers are implementing this practice. The participants cited the structure of textbooks that often have an initial chapter on science methods, and traditional teaching practices that do not integrate inquiry and engineering design into content instruction. Another area of interest is the perception that about three-fourths of teachers are aware of the learning by their students before and after their grade. This is especially important with the gaps between grades for concepts in our standards. For example after astronomy is taught in third grade it does not reappear until 8th grade. “When will we get new science standards? Will we adopt national standards? Many people are asking these questions to us at the Department of Education (MDE) and the answer is often different than what is expected. Even though Minnesota was a lead state for the writing of the Next Generation Science Standards (NGSS), it is not a given that we will adopt those standards. There is a process for revising standards that is directed by state statutes. Here is an of overview of how Minnesota will revise science standards. Content Standards are foremost a means to provide equitable education. They provide the learning goals for all students so that children across the state and student population have the opportunity to achieve a solid education. This is important for the high mobility of students as they move between schools. The standards provide an coherent progression of learning as students advance through the grades. This is especially important in science where new concepts and skills must build on previous learning. Minnesota Statute 120B.021 sets the process and schedule for standards review. The science standards will be reviewed during the 2018-19 school year. This is a change that the legislature made last year from the previous schedule of 2017-18 in order to accommodate the writing of health and physical education standards this year. What are the requirements for standards? The standards must be formatted with standards that proved broad ideas and benchmarks that specify indicators of learning at each grade K-8 and the band of 9-12. They must include contributions of Native American communities and reflect standards on information technology. A Review Committee of 20-40 people representing a variety of stakeholders will be formed through an application process. The Committee will receive input through on-line surveys, town meetings, focus groups and expert reviewers. The Committee will study current research on effective science education and will evaluate current models for science standards. The recommendations of the Committee will go to the Commissioner of Education. They could recommend to keep the current standards, make revisions or adopt another set of standards. The Department of Education will publish the “final draft” of the standards probably in spring 2019. This will be usable by schools to start planning for implementation and for MDE to begin writing the next version of the Minnesota Comprehensive Assessment (MCA). Full implementation of the standards will likely be three to four years later. The standards become law through Minnesota’s Rulemaking process. They do not go to the legislature for approval. More details of the standards review process are available at the MDE Standards Page.